Liza Lou challenges traditional definitions of painting, sculpture, and craft in her dazzling installations made entirely of glass beads. Color Field, the artist’s largest sculpture to date, is an abstract work that pays homage to the original Color Field painters of the 1950s and 1960s such as Mark Rothko, Helen Frankenthaler, Morris Louis, and Kenneth Noland. 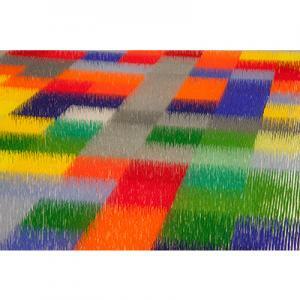 At approximately 1,800 square feet, this work will carpet nearly the entire floor of the Neuberger Museum of Art’s largest gallery in a shimmering field of color. Lou originally created Color Field in Durban, South Africa, where she lived from 2005-2014, working with a team of nearly 30 Zulu women artisans. The work will be re-created on site at the Neuberger Museum. The exhibition also will include Lou’s Solid Gray and Color/White canvases, a series of woven beaded works in various hues. Liza Lou: Color Field and Solid Gray is organized by the Neuberger Museum of Art, Purchase College, SUNY, and curated by Helaine Posner, Senior Curator of Contemporary Art. The exhibition is made possible with generous support from Donna and Marvin Schwartz. Additional support is provided by ArtsWestchester, with support from the Westchester County Government. image: Liza Lou, Color Field, 2013/2015, glass beads, stainless steel and Perspex, courtesy of the artist. Photo: Pablo Mason.